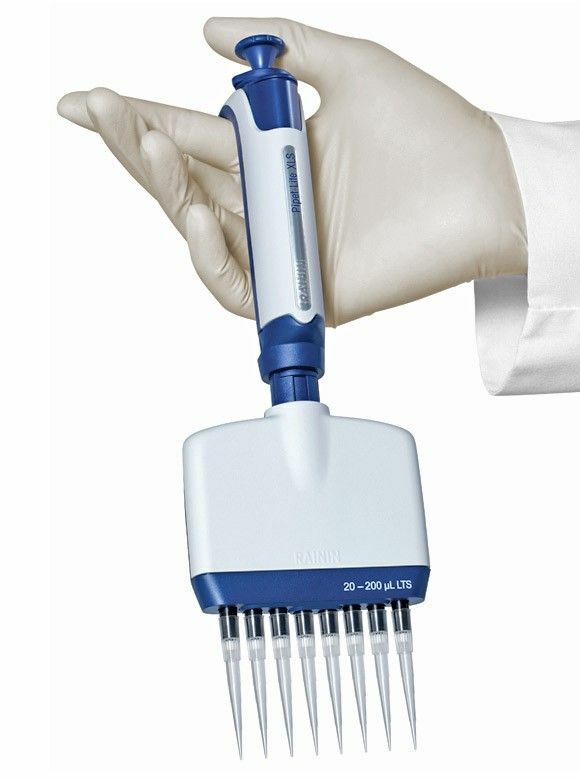 What is a multichannel pipette? Multichannel pipettes are air-displacement pipettes that work similarly to single-channel pipettes. Multichannel pipettes feature multiple nozzles (usually 8 or 12) arranged in a horizontal row on which tips are mounted. Channels are spaced 9mm apart to align with the wells of a 96-well plate – the most common assay platform in life science labs to speed up routine pipetting. Put the XLS+ multichannel pipette's cutting-edge engineering to work and get a higher volume of precision work done, reproducibly, with exceptional comfort. New elastomeric seals and polymer tip ejectors, along with Rainin's patented LTSTM LiteTouch SystemTM, deliver smoothness and control. Lightweight and designed for use with either hand, the durable Pipet-Lite XLS+ is among the most ergonomic manual multichannel pipettes available. The sure-fit handle, light springs and "stiction-less" sealing technology ensure smooth, light operation and significantly reduce the risk of repetitive strain injuries. The carefully shaped fingerhook enables a relaxed grip. Service records, cycles and status data are recorded to the XLS+ pipette's embedded RFID tag and are completely tamper proof, in full compliance with GLP/GMP standards. With accuracy and precision that is better than or equal to other premium pipette brands, XLS+ pipettes deliver data you can trust. With 11 models to choose from, Pipet-Lite XLS+ offers the most pipetting volume ranges, from 0.1 µL to 20 mL. The sealing system on XLS+ pipettes delivers a plunger stroke that is smooth, precise and requires less force than ever. Perfect for pipetting applications that require delicate control! With sure-fit handles, lighter springs, “stiction-less” low-drag seals, and Rainin's patented LiteTouch System™ technology, Pipet-Lite XLS+ pipettes perform all day without causing pain or discomfort. Redesigned ergonomic handle rests perfectly in the hand reducing tiredness and compromised pipetting performance. The finger hook allows the hand to relax between pipetting cycles. The snag-proof lock design on XLS+ pipettes prevents accidental volume drift, yet is easy to adjust even while wearing gloves. XLS+ pipette is designed for easy autoclaving where it counts: the complete liquid end, including the seals. The shaft and tip ejectors are easy to remove and autoclaving won't compromise performance or feel. A continuously variable spacing mechanism lets you choose the distance between the channels from 9mm to 19mm (6 channels) or 14 mm (8 channels) - for maximum flexibility.